Our grand finale was icing on the cake. After the early morning Barat followed by breakfast, ceremony, lunch, cocktail hour on the same day came the evening hour of our grand finale reception. The bride and Nikki had spend countless hours on the phone going over the design elements. She still wanted understated elegance which was also ethereal. 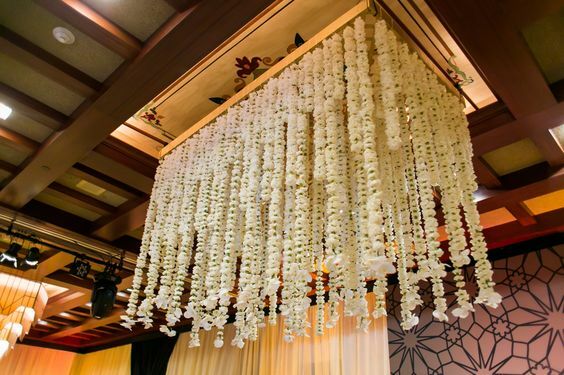 The room was carpeted in ivory matching the ivory draping on the walls. Gold tassels added to the drama. 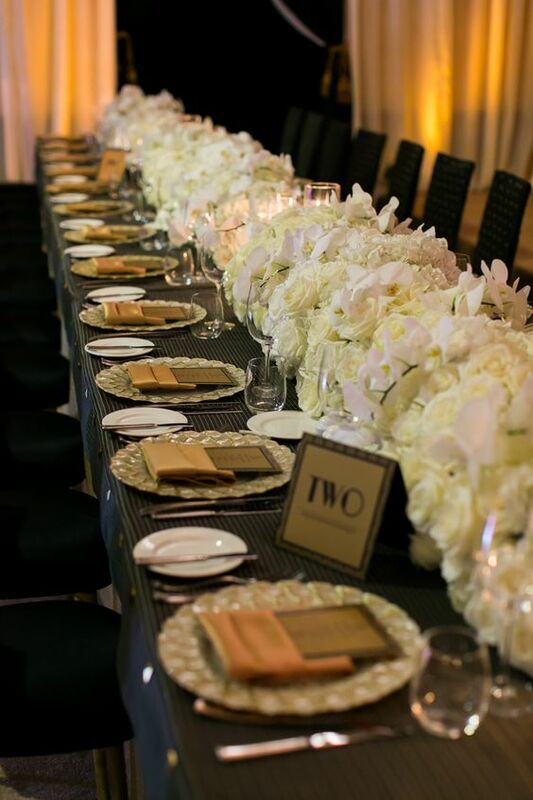 Long smokey mirror tables with rounds were a perfect compliment to the design specially with tall centerpieces covering the middle of each table. The stage backdrop was simple and elegant and ivory dance floor bearing couple's names was again tied to create a cohesive look. Lighting was in warm amber candle light color and added to the romantic vibe. Bride popped in her beautiful red outfit while the groom was dashing in his tuxedo. The evening from the time guests entered to the couple's grand entrance, first dance, welcome toast, cake cutting, speeches was flawless. Guests noshed on delicious meal prepared by Amber India while also enjoying the photo booth outside in the foyer. The evening had amazing energy and ambiance and the dance floor was packed the entire evening proving this was indeed a successful event. Special thank you to our partnerss! Sonia and Shaan's parents booked our services eight months before their wedding date in November of 2016. Month of July 2017 was decided and after much search on the two venues for their Sangeet and the main events, Fairmont San Jose and Ritz Carlton Half Moon Bay were booked. Since the couple got engaged in Napa, they wanted to bring the Napa vibe for their wedding. After much deliberation and many phone calls, a color palette of ivory and green was decided for their ceremony and reception. A thorough design walk thru was conducted at Ritz Carlton Half Moon Bay with the couple and not only did we discuss all main design components but also the flow of events from Barat, ceremony, post ceremony lunch, cocktail hour and dinner reception. After returning from the initial trip, we went to work to create the story board incorporating all design elements and proposals based on those. After much deliberation and phone calls, final decisions were made around June when Nikki and team flew for the mock up. Actual linens, chargers and napkins were brought in from LA and the table had the ethereal and elegant vibe the bride was looking for. 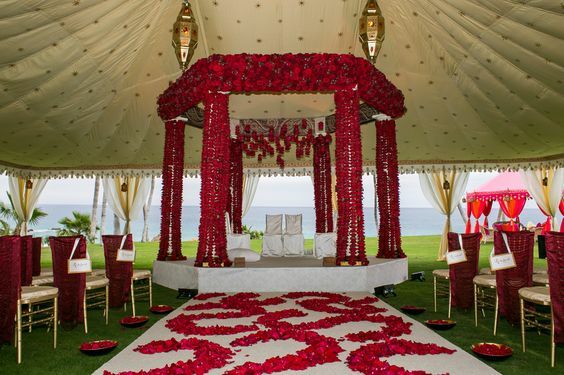 Upon bride's request even a section of mandap was shown with flowers and after some tweaking all was confirmed. Rest of the afternoon was spent in discussing time line and flow of events with the couple and both families. Nikki and her team flew to Northern California a few days before the event to manage deliveries and set up. 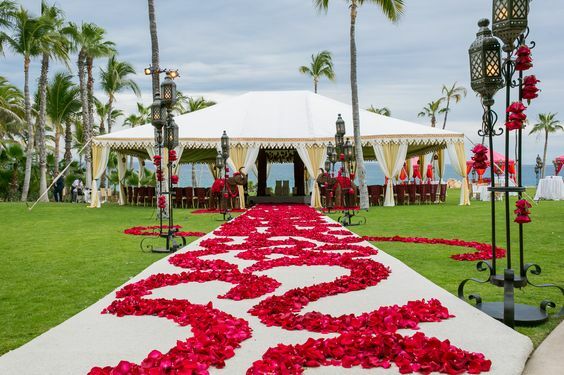 Ceremony site was Ocean Lawn and bride chose an open structure so not to block the ocean view. 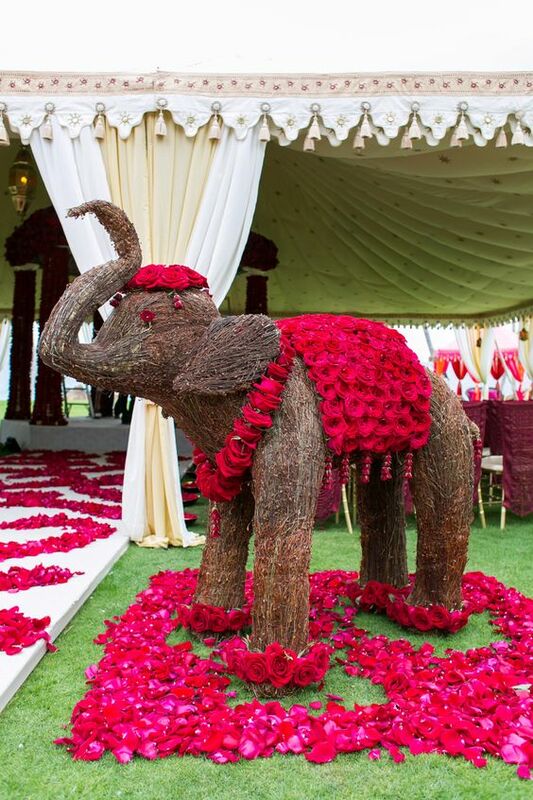 It was a simple and elegant set up and bride was a vision in Sabyasachi when she walked down the aisle. Ceremony ended with couple and families taking photos while guests made their way for lunch. Ocean lawn was again chosen for cocktail hour and Nikki chose crisp white color for this setup. A huge circular white bar sat atop where the mandap was in the morning. There were white lounge furniture vignettes, high boys and cocktail tables adorned with white linens and flowers. 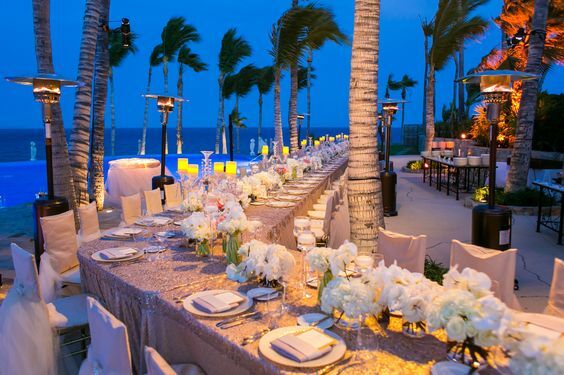 Multiple large mirrors bearing guest names for seating were displayed on the lawn and guests noshed on delectable bites and beverages amidst beautiful music. They had yet another surprise to come to which was the reception. Stay tuned for the reception in next week blog. We were so excited to plan Sonia and Shaan’s wedding since it was a destination wedding and we were thrilled to head up North to the Bay Area. Festivities kicked off with the Sangeet at the Fairmont San Jose. It was a Moroccan theme with festive colors like pinks, oranges, golds and turquoise. The colors really brought the celebration to life. 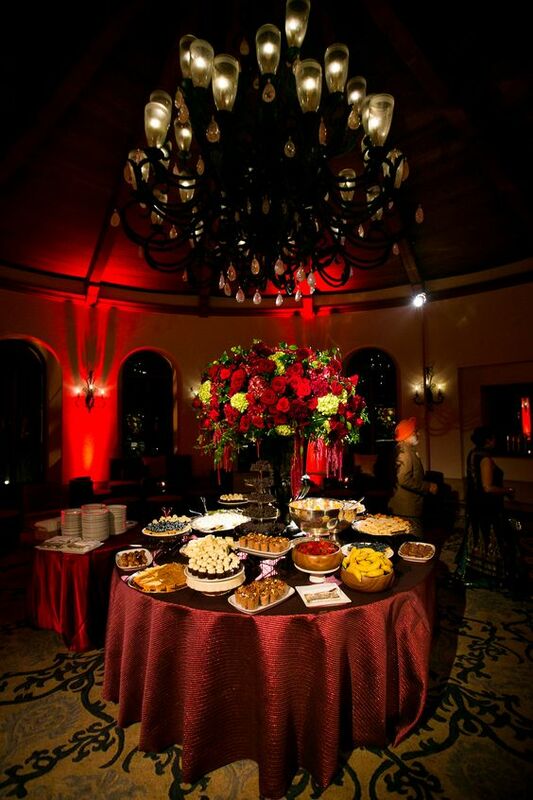 Gorgeous lanterns, candles and ornate pillows were brought in to decorate the room. 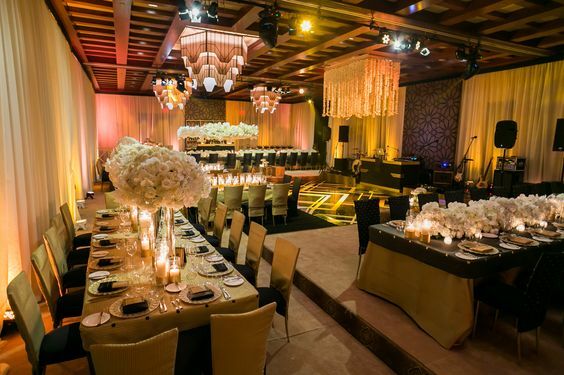 The furniture and tents surrounded a large custom designed dance floor that made such a statement in the ballroom. All eyes let you to the couples stage. 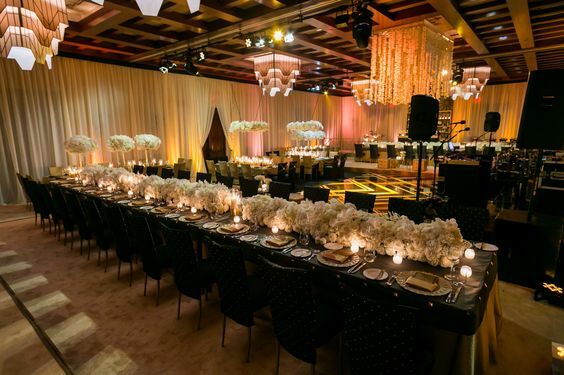 There was an assortment of golden lanterns hanging against the pink draped linen, accented by the golden curtains and tied with floral arrangements. Guests danced the night away to a live band and were treated to the most delicious food stations that served international cuisines; one of which was our favorite Burmese dish, Kow Sway which they were making to order and was absolutely divine. Stay tuned in the upcoming weeks as we feature the ceremony & reception!